The Coda Air Filtration System is proven to increase the air quality by reducing the contaminants, volatile organic compounds (VOCs) and chemical air contaminants (CACs) present in the incubator, laboratory supply and your CO2 supply. The NEW Xtra Inline Filter is 12.25″ (31cm) long, about 30% longer than the classic inline filter which give greater effective due to an increased amount of filtering materals. Inline filters are recommended for use for 2 months while Xtra Inline Filters are recommended for use for 3 months. Coda® Filters are for use inside the CO2 Incubators and environmental chambers to filter VOCs and contaminant together with Coda® Incubator Unit or Coda® SP Unit. Coda® improves air quality in your incubator and in your laboratory and improves embryo and cell development and results. Current research show that indoor air environments can present the greatest potential health risk as pollutant concenrations can be 8 to 10 times more toxic than outdoor air. 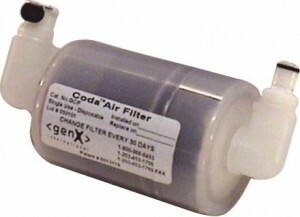 Coda® filters are manufactured in a cleanroom environment, inspected and tested, and the filters are gamma irradiated. The Coda® System has proven to be successful in over 300 clinics worldwide. These products continially decontaminate from the inside-out, GMP compliance and FDA cleared. Patented.